This band looks like it is made for a king. 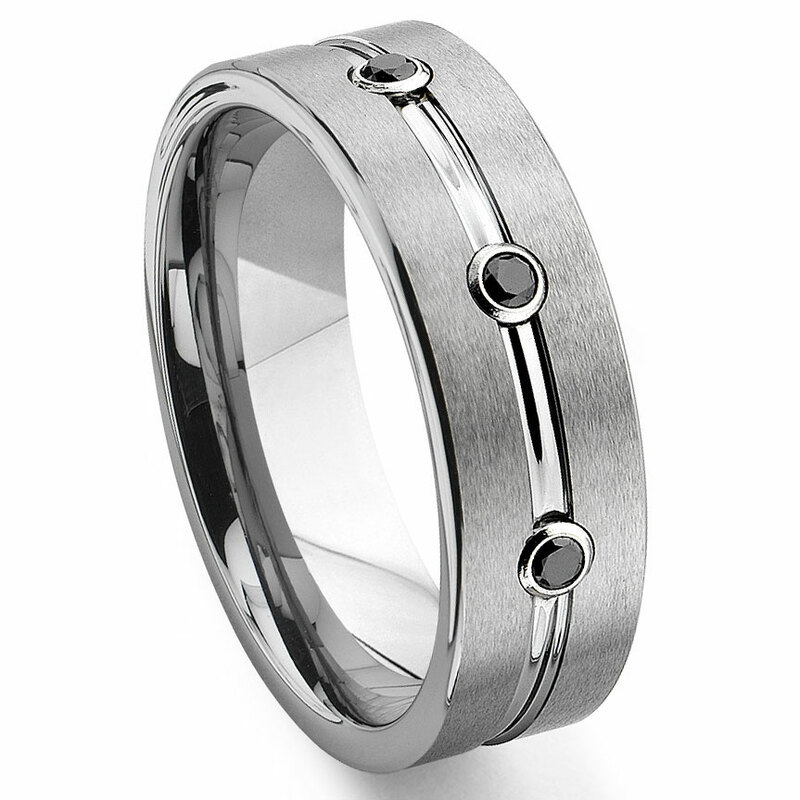 The regal looking men's wedding ring is 8mm wide and made of tungsten and 3 VS1, Color GH, 0.1 Carat Weight, black diamonds, embedded in the rib in the center of the ring, which runs parallel to the edges of the men's ring. This wedding band is also manufactured to last a lifetime using tungsten one of the strongest metals in the world. Like all of our wedding rings, this one too is also covered by a free 100% lifetime warranty which covers also any precious gemstones set on the rings. Rating: 4.7 / 5 , based on 9 reviews. The ring is absolutely gorgeous and as described. The fit is perfect and my fiance was so pleased with it. I am very happy with my purchase! I ordered this ring for my husband a week before our wedding. The shipping was exactly what we needed to get the ring here on time. It was a perfect fit, and everyone was asking where we got it after the wedding. Great website! I was looking for something unique and high quality and found what I was looking for. Thank you Titanium Kay for providing both with fast delivery. Other companies should take note of what you are doing! I bought this ring for my fiance and I could not be happier!!! The ring is true to size. The black diamonds are amazing and give this ring a sharp appearance! We have gotten tons of compliments on it! Thanks Titanium Kay!! the ring was really nice online and in person. he loves it and it looks great. the only I have a problem with is when I thought the number lock was on when I put the ship to on the order it wasn't. so I called to make sure they could fix it before it was shipped. I had to explain in three different ways as to what I needed. they couldn't understand because they didn't know enough english to get what I needed to have done. all in all it was a great find and we will be doing more shopping later in life. hope this helps. Thank you for this wonderful ring! It was just what we wanted. It looked great online but when we got it in the mail it was AMAZING. Thank you so much. The shipping was very quick. very pleased with the ring. only problem was i had to pay extra postage. This ring is GORGEOUS and best of all-it's strong and I'm confident my husband cannot damage it. Prompt shipping as well. I've already made another order for another ring and I've referred you many and they have purchased from you as well. Wonderful products!